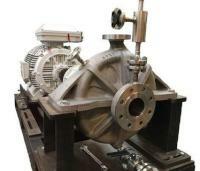 Amarinth, specialising in the design, application and manufacture of centrifugal pumps and associated equipment to the oil and gas, petrochemical, chemical, industrial, power and renewable energy markets, has secured a further order of API 610 OH2 pumps to be used aboard Total’s new Egina FPSO vessel. Amarinth’s Malaysian operation secured this second order for API 610 OH2 super duplex pumps for a de-sanding and process water treatment package aboard Total’s Egina Floating Production Storage Offloading (FPSO) vessel following on from its successful delivery of a previous order for API 610 OH2 pumps with Plan 53B seal support systems. The 200,000 barrels per day capacity Egina FPSO vessel, being built by Samsung Heavy Industries of Korea at a cost of USD 3.3 billion, will arrive in Nigeria around April 2017 and will be working in Total’s USD 16 billion Egina deep water field situated 150 kilometres off the coast of Nigeria in water depths of up to 1,750 metres.